“I just wanted to write to you to say what a wonderful experience the Wild Zone was. It was simple, educational, and inspiring. While I had the opportunity to grow up near forests and lots of open space, my 2nd grade son has rarely had the opportunity to actually play/work in such as space. The Wild Zone provided him an opportunity to invent and create in a way he hasn't had a chance to before. What struck me about the kids that went even beyond what I expected, was the interaction by the kids between themselves. At first the kids started on their own or with a few familiar faces. They gradually they explored the works of others. Interestingly the first encounter between a couple boys wasn't friendly. One child didn't want the other visiting "his" space. However, with no parent supervision, through a series of different approaches they resolved differences and actually started cooperating. My take away from that is in today's global economy to raise kids that are leaders and creators we need more then simple rote skills. We need kids that can engage the world. A world full of differences and unexpected landscapes. Those kids need more then being capable is simple math and reading. Where does one get that kind of training? In a structured classroom? Probably not, probably in just the kind of environment you have created. We are a family from Mountain View and came with other families from there as well. My son is a student as Castro Elementary school, which has a population of parents unable reach destinations outside of bike/walking range. We would love to get involved with other Mountain View families to find a way to establish a Wild Zone in our city to make it more accessible to our community. 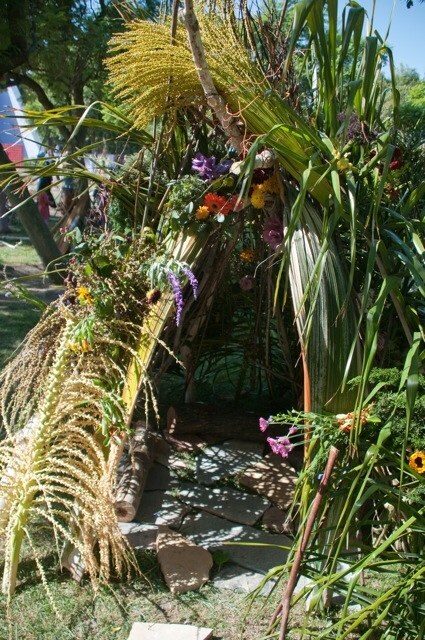 “A couple boys had already constructed a giant and beautiful tepee, with sticks and palm fronds, and ‘flowers to make the place pretty and smell good’ in the boys own words. They were in the process of building a floor and patio with flat rocks. I should point out how much teamwork was going on here. Not only did little groups form to create these fabulous places, but the kids walked around helping one another. A few little girls stopped to admire the flowers and add some of their own. Watching the kids carry around giant rocks, and my sons with huge sticks, I kept an observant eye, but let them play and chatted with the parents. Given their love of jumping off high places, I had to learn early on to let my kids take risks, and to keep my heart in check. “On the way to the Wild Zone workshop the students were skeptical about the value of spending their time on this. Even after they got the instructions about what they were to do a few of them thought it was rather silly stuff and weren’t sure what was expected of them but, as they became involved. even the most reluctant really liked it. They were surprised by what they could create. It was very beneficial. They were much more relaxed afterwards and in contact with themselves as well as pleased with what they had achieved.